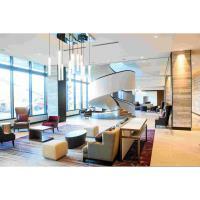 ROCHESTER, Minn. (March 28, 2019) – Designed to meet the city’s growing luxury market demands, construction has been completed on the Hilton, a new upscale hotel located at the corner of South Broadway and East Center Street in downtown Rochester. The 264-room luxury hotel, which will be managed by Avra Hospitality, is expected to be one of the Midwest’s premier properties and will welcome its first guests on April 16. The project was developed by Rochester-based Titan Development & Investments in partnership with Chicago-based Harbor Bay Real Estate Advisors. Kraus-Anderson Construction is the general contractor and Rochester’s HGA Architects and Engineers designed the project. The debt is provided by First National Bank of Omaha, the lead bank. There are multiple guest room configurations to meet varying demographic needs, including lavish suites on secure executive and concierge floors. The top floor features premier suites with concierge services. In addition to the Hilton’s modern design, there are numerous amenities, including a rooftop terrace on the fifth floor, fitness center, indoor pool, sauna, steam room and spa. There is also a private car service and skyway access to Mayo Clinic and downtown businesses. Onsite dining options will provide a variety of choices for the local community and city visitors from a savory breakfast at Benedict’s to an amazing steak at Pittsburgh Blue Steakhouse. The high-tech conference center is being leased by J.Powers and features two ballrooms with spectacular city views. There is also a breakout area with flexible configurations and a rooftop terrace. The Hilton is one of the first projects under Rochester’s Destination Medical Center (DMC) initiative -- a public-private partnership to position Rochester as the world’s premier destination for health and wellness. DMC (www.dmc.mn) is the largest economic development initiative in Minnesota and one of the largest currently under way in the nation. Kraus-Anderson also was the construction manager for the City of Rochester on the new 7-level parking ramp with 630 vehicle spaces adjacent to the Hilton. There are 90 spaces dedicated for hotel visitors. Titan Development & Investments focuses on the development of hospitality properties, market rate apartments, affordable housing, and Senior Living communities throughout the country. Their extensive expertise of acquisition, finance, syndication, design, development, and construction allows them to successfully shift to different asset classes as the market changes. More details can be found at titandevelopment.us. an Affirmative Action, Equal Employment Opportunity Employer, is headquartered in Minneapolis, Minn. and has regional offices in Madison, Wis., Bismarck, N.D., and Duluth, Bemidji and Rochester Minn.